Anyone who uses their motorcycle for more than just sport riding knows how difficult it can be to find a good way to take a few items along for the ride. I spent the past few weeks using Kreiga’s new messenger bag to see if it’s up to the task. Whether it’s a computer or change of shoes for work, a camera or clothes for a little trip, or just a clear visor and hoodie for the night’s ride home—nothing really seems to nail the job well. Backpacks are tough to get on over armored jackets and never seem to be built with daily use in mind, and messenger bags often flop around on your back and interfere with operating a motorcycle. People say it’s hard to find a good pair of riding jeans, but a good pack is the unicorn of motorcycle gear. If you’ve followed Wes or I for any amount of time, you’ll know we’re both huge fans of a little brand called Kriega. Their backpacks have this genius little system which allows them to distribute the weight of the pack evenly over your torso. This greatly reduces the perceived weight, as well as the toll it takes on your body - making their packs our favorite for any sort of a trip. The problem with Kriega backpacks has always been that they’re a.) so cavernous inside that your MacBook Air will fly around unless you toss some clothes in their to hold it still and b.) they look sort of like parachute packs. I wore one when I rode to work while I was teaching and kids always asked if I jumped out of a plane to get to work. Saying yes made me even cooler in their eyes, but I can see how people in an office environment might want something a little more reserved looking. The Kriega Messenger Drypack measures 12.5 inches tall by 15.75 inches wide by 5 inches deep, which gives it a storage capacity of 16 liters. It’s built to last, with 420 denier ripstop nylon on the low impact areas, 1,000 denier cordura on the chassis of the bag, and something called HYPALON for base and outer flap. It’s single strap uses Kriega’s CNC 6061-T6 alloy slider, and the flap uses two 25 mm Acetal quick release buckles. If all of that sounds like some crazy science mumbo jumbo, you’re right as they’re all aircraft grade parts. It also comes with a waist strap, which isn’t aircraft grade but is very helpful. The bag uses a rolltop design, which is how Kriega can claim it’s 100% waterproof. The front of the bag has a vertical zipper which opens into a pocket that runs the full length and height of the bag. There is another large pocket in the flap of the bag, which is covered in Kriega’s coated mesh. You can strap up to two US-5 Drypacks onto the chassis of the bag, under the flap, if you need the extra storage or compartmentalization. For those of you who want a little something on the front of the bag, it will accept the Kube Pocket on the front strap. The Kriega Messenger Drypack retails for $189, comes with a 10 year warranty, and you can buy it at RevZilla. The Messenger Drypack is extremely easy to put on. Twice I’ve forgotten to put it on before my helmet (because unlike backpacks, you normally need to do that with most messenger bags) and I’ve had no problem using the harness system to quickly loosen the strap, put it on, and then tighten in to my desired fit. It’s also extremely comfortable. The fairly wide strap, combined with the thick leather of the top of the shoulder strap, make wearing something that distributes the weight unevenly comfortable so long as the load isn’t too heavy. The back of the leather on the strap is designed to keep it in place, so it doesn’t slide or rotate around your body unless you want it to. The Messenger Drypack is, in typical Kriega fashion, very well thought out. Most of us are right handed and will wear the bag over our left shoulder, which makes the zippered enclosure on the front of the pouch easy to reach. For those of you lefties (or righties who want to wear it over your right shoulder), switching the straps is easy. The Kriega Messenger is as close to the perfect size for daily use as you’re going to find. I tossed my laptop and a small notebook in it to go to a meeting, but also fit a towel, boardshorts, a change of shoes, a water bottle, and a sandwich in it when I met up with some friends at the beach. Sidenote: the weather treated exterior doesn’t hold onto sand. This is a bonus. My biggest issue with this bag is that Kriega refused to dilute their product line with something that couldn’t withstand the elements and they had to make this bag 100 percent waterproof. Doing so requires a weather resistant outer, which is awesome, but also using a separate inner liner with a rolltop closure design. This made tossing my computer in it or quickly getting my notebook out of the main compartment a pain. I know that many of you will appreciate a waterproof bag, but I would have really liked to see them offer something with this wide an application in an option for those of us who rarely, if ever, ride in the rain. My only other issue with the bag is the fact that they still felt the need to include a huge logo on the shoulder strap. I don’t mind the little tab on the outside of the flap, but for me to really be excited about this “urban” bag, I would want it to be mostly unbranded so I could dress it up for work or taking it somewhere nice. This may sound like nitpicking, but a messenger bag will always feel a little more adult than a backpack - and having something that looks nice and understated will always be more appropriate for real adult life than the stuff we get away with on dirtbike gear bags. For those of you who agree, this bag is a really nice option. For those of you who don’t, go get a Kriega R20 or keep rocking that ICON Squad 3. I’ve been using the Chrome Industries Motor Barrage backpack for the past year, mostly because it’s durable, looks decent, and has a laptop compartment - but have found myself gravitating towards the Kriega Messenger bag more and more because it’s easier to swing of an on, has less straps to fly about, and because, as a 30-something year old man, I think I need to wear backpacks less. If the rolltop design doesn’t bother you or you live somewhere that gets a decent amount of rain, and you don’t mind the logo on the strap - this is absolutely the bag for you. Those two things aside, it’s perfect. However, the whole aesthetics and ease of use thing sort of go hand in hand with messenger bags - otherwise a backpack is better almost across the board. 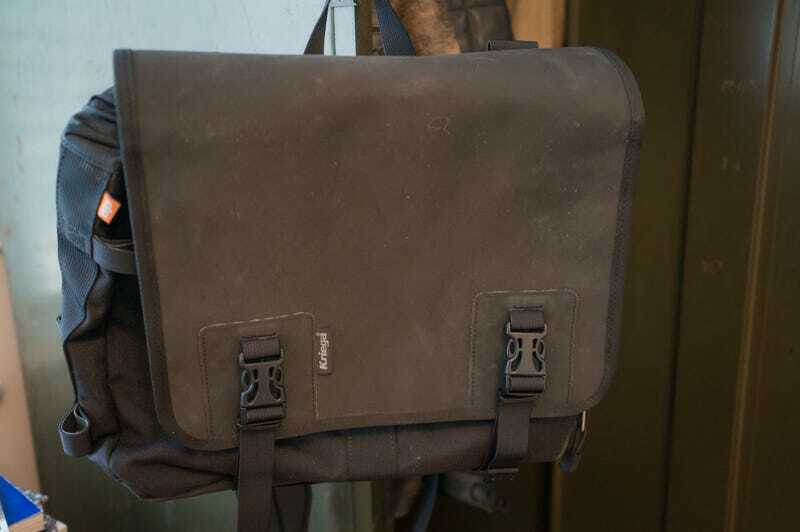 And, since this bag doesn’t nail it in those two departments, if you use a messenger bag like I do I would probably pass until I can bully Kriega into a Sean MacD edition or something.